Are retiring Supreme Court justices negotiating the terms of their exit with the POTUS? WE CERTAINLY HOPE NOT ! ! ! That’s the question raised by reporting from NBC News on Tuesday morning. Reporters Geoff Bennett and Leigh Ann Caldwell tweeted that the departing justice spent months negotiating with the Trump White House about his replacement, and that Kennedy only retired after he received assurances that it would be Brett Kavanaugh, a D.C. Circuit Court of Appeals judge and a former Kennedy clerk. Politico offered a slightly different account of the Kavanaugh selection process, reporting on Monday night that Kennedy, in a conversation with Trump about his imminent retirement, merely suggested his former clerk as a successor. That recommendation then carried great weight with a president eager to leave his mark on the nation’s judiciary. There’s nothing unusual about a Supreme Court justice timing his or her retirement to ensure an ideologically similar replacement. But what NBC’s report describes is quite different. Any bargaining between a sitting justice and the White House would immediately raise ethical questions about his or her participation in cases involving the president. Kennedy voted to uphold Trump’s controversial travel ban the day before he announced his retirement, for example. That said, it’s possible that what happened still fell short of an overt quid pro quo between Kennedy and Trump. The president and other conservatives made little secret of their desire to replace the court’s swing justice after the 2016 election. 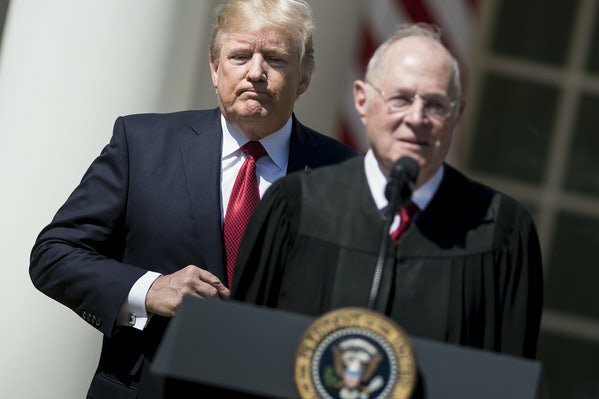 Trump’s selection last year of Neil Gorsuch, another former Kennedy clerk, to replace Antonin Scalia was widely considered to be a not-so-subtle nod at the 81-year-old jurist that Trump would nominate a similar successor to him. Kennedy may have simply taken the hint and offered a suggestion of his own on the way out.